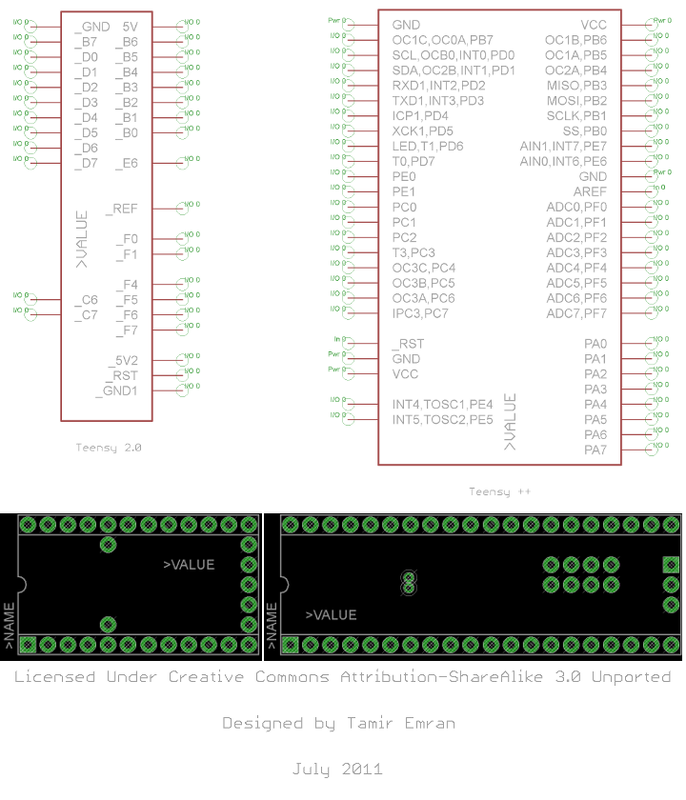 XenGi shared this library for Teensy on KiCAD for all Teensy boards. Mark shared his Eagle library for Teensy 3.1. "kam42" posted an eagle library for the MK20 and MINI54 chips. Russell Nelson is working on symbols for GEDA. Matt Barnett sent files for Teensy++ on KiCAD. Mark Gross created an Eagle library for the Teensy++ for his line following robot project. The file can be found on bitbucket or eagle_lib_teensy-libs.zip. Mark would like your feedback: "I think it should be reviewed again, But I think its mostly correct." Please email Mark at markgross at thegnar dot org if you use his library. Clint Fisher also created a library for the Teensy 2.0, eagle_lib_teensy_clint_fisher.zip. Caution: the hole sizes on this library have been reported too small for header pins, which usually require at least 0.038 inch / 0.97 mm diameter.